There aren’t many books for middle schoolers out there that sport blurbs from folks like Jon Stewart and Judd Apatow. There is, in fact, only one. Which means that we’re talking about a book written for kids that is hoping to reach those youngsters out there who enjoy watching The Daily Show on DVR and Superbad on DVD. Probably boys. Adolescent, definitely. And no wonder, since the author (Josh Lieb) actually is a head writer on The Daily Show and everything. But since I (A) like boy books and (B) was a huge fan of the similarly plotted Evil Genius by Catherine Jinks I figured I had a chance at liking this one. And I did. Quite a bit. The book is the ultimate wish fulfillment fantasy of any child more intelligent than their cruel classmates. Lieb does a masterful job at tapping into the humor and hatred that seethes beneath the surface of every seventh grade boy. The ending leaves something to be desired, but on the whole the book is a hoot and for a certain kind of kid it’s hugely entertaining. If you encountered Oliver Watson in school you’d probably think he was the biggest dumbest dork on the planet. All his fellow classmates feel that way, and his parents don’t think he’s all that bright either. Get to know him a little better, however, and you’d better hope he’s taken a shine to you. Oliver isn’t just a genius. He’s a supergenius, multi-billionaire, using his current state as a middle school "slow" chubby kid as the perfect front. And, as he himself says of his current childlike state, "time will cure this unfortunate condition". With half the hemisphere in the palm of his hand, you would think that nothing would get to Oliver. Yet the thorn in his side, the father he despises ("Daddy") gives him the impetus to do something he’d never think he’d want to do: run for class president. Oliver can crush his enemies without a second thought. So why is it that running for class president is so difficult? And what is it that Oliver really wants? Photographs, notes, illustrations, and other ephemera spot the text. Oliver reads like an escapee from Children Of The Atom. He’s what every smart kid stuck in middle school wishes they could be. Playing classmates for the fools they are. A secret arsenal of weapons at your disposal. Adults cowering before you. What’s not to love? For a while there I tried to reinterpret the story as a delusion taking place entirely in Oliver’s mind. You could probably make a pretty strong case for that if you wanted to. Really, it isn’t until Oliver sees the surprise his campaign managers have created for him that you understand how real his little world really is. Even if you don’t think the book is a delusion, however, you can’t help but agree that Oliver is an unreliable narrator. He’s quite dedicated to the notion of being an evil genius, but is unwilling to commit to absolute evil. His mom’s a good example of this. Within the same paragraph he’s one moment saying, "Am I capable of love? A question even I can’t answer," to later mentioning "I like to make her smile, and I try to do that a lot." And, of course, it’s funny in a rather enjoyably heartless manner. I Am a Genius marks the first time I’ve ever read a book where a character tried to play matchmaker in the hopes of making the two people more miserable than they would be apart. Great lines in it too. "The maternal instinct is strong in this one," for example. And any book where the character publishes, "counterfeit Archie comics, in which Betty and Veronica dump that idiot Archie and devote their lives to worshipping the great Reggie" is obviously going to appeal to my generation more than middle schoolers, but I don’t care. It’s awesome. Besides, Jughead was recently spotted in an Archie comic wearing a "Don’t tase me, bro" t-shirt, so maybe kids today are ready for that kind of humor. The recommended reading age on this book is tough. I don’t think I’ve ever read such a thoroughly middle school aged book in my life. It’s just a touch young for high school while definitely not elementary school either. Between the mild profanity (the occasional "jackass") and oblique references to masturbation, we’re talking 6th, 7th, 8th grade all the way. High schoolers could get a kick out of it, sure. And 4th and 5th graders will feel quite edgy, but if you have to put it anywhere it’s Junior High from tip to tail. Lieb probably wouldn’t want to hear it, but the book that this title owes the most to has to be Diary of a Wimpy Kid by Jeff Kinney. Both books are first-person narratives of unapologetic self-centered egotists with hilarious texts. Both have images illustrating characters, ideas, and gags. The difference is in their endings. Kinney has managed over the years to convince his editors that the amoral ending is something kids can handle. Maybe that has something to do with the format itself, but whatever the case Kinney gets away with murder. Lieb isn’t as lucky. For whatever reason he had to make the book meaningful at the end. The last four pages, to be exact. He’s been setting us up for some time, making it clear that Oliver strives to get his father’s approval even as he does his dambdest to make the man’s life a living misery. Then we come to the end and Oliver is strangely hurt by his classmates’ reaction to him in an uncharacteristic moment of weakness. This rings a little false (particularly when he says that the evil girl of his dreams is "the Meanest Girl in School") and is then immediately followed up with a strange moment of reconciliation between Oliver and Daddy. I dunno. Something tells me Lieb should have stuck to his guns and given the book a Wimpy Kid ending, mocking the standard happy dappy learning-and-growing titles out there. As it stands now, the ending renders the book a bit . . . well . . . normal. But it’s a small detail in an otherwise entirely enjoyable affair. 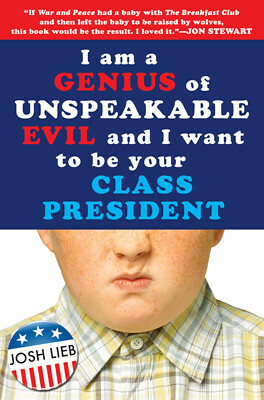 For those kids who want something "exactly like" Diary of a Wimpy Kid this book is definitely along the same lines. Funny, packed with images, and entirely original it’s just enjoyable. Middle school through and through. Don’t be surprised if you find kids begging you for the sequel too. There’s not one yet, but Oliver’s too great a kid to leave alone for long. Notes on the Cover: Designed by Kristin Smith it’s not half bad. It’s just a Getty Image with a bunch of other Getty Images slapped against a white background (the back of the cover features a blimp, a camera, and a video camera). That’s the back. The front is all kinds of red, white, and blue with that fabulous scowling kid, lower half of this face only visible. He’s a great kid. Right weight. Top button of his shirt is, yes indeed, buttoned. If the book does well enough I’ll be interested in seeing whether or not the Jon Stewart blurb on the front remains (it reads: “If War and Peace had a baby with The Breakfast Club and then left the baby to be raised by wolves, this book would be the result. I loved it.” – Jon Stewart). As Getty Images go, this is one of the better. Lieb mentions some of his own similarities to Oliver at The New Yorker‘s blog The Book Bench. And yes, the film rights have already been sold . . . as of March 2008. That was a no brainer. Just make sure they know that they can’t get away with casting Jonah Hill in the role. Seriously. And hopefully the McG rumor is just that. First, a strangely intense interview over at Big Think. Other interviews have him declaring his love of Daniel Pinkwater, what gets him excited, and why not to write for TV. And finally, just your standard celebrity endorsement. Ho hum. I liked this a lot too. Had a problem with the end, just wasn’t sure how to take the (temporary?) reconciliation with Daddy. Also, not sure the precipitating crisis at the end actually rings true with the character- but maybe if we accept that no matter how smart, he is still a junior high kid emotionally? But overall I think it is definitely a good read. Exactly. It had me right up until those last four pages. Then it was like the author switched gears and had to make it “meaningful”. I wished he’d stuck to his guns and just plowed through the end relentlessly. Ah well. Still fun. Library of Congress (and, consequently, my public library) has the title of this book wrong. They have it as I’m a Genius… I found it by author, but other patrons might not be as persistent. Librarians out there might want to check your records if you have this one to see that it’s right. By the way, the album picture in the book isn’t fake. Trout Mask Replica (and Beefheart and the Magic Band) are real. Get out! Are they really? Well shoot. As faux band names go, I thought that was a shoo-in. Fair play to the bands then. I didn’t like this one because the character was so evil, but my teenaged son and a male teacher thought it was hysterical… right up until that weak ending. Hear there is a sequel coming out.